The percentage of overdue B2B invoices in the Czech Republic continued its downward trend. In 2017, the country’s payment default rate stood at 37%. After a slowdown in 2016 (2.3%, down from 4.6% in 2015), the Czech economy is forecast to grow 2.5% this year as investment picks back up and net exports and domestic demand remain strong. Despite the positive outlook, there were fewer sales on credit terms compared to one year ago. Together with respondents in Turkey and Poland, and in contrast to the increase registered at regional level, Czech suppliers seem to have decreased their use of credit terms in B2B sales this year. On average, 42.7% of the sales to domestic B2B customers in the Czech Republic was transacted on credit. This percentage is slightly lower than that of 2016 (45.8%). In 2017 Czech respondents seemed to be marginally more open to offering credit terms in transactions with their foreign B2B customers (43.2% up from 42.7% in 2016). Differently to their peers in Eastern Europe, Czech respondents were more likely to offer credit terms to foreign B2B customers than to domestic customers. However, the proportion of domestic B2B sales on credit (42.7%) is not significantly lower than that of foreign B2B sales on credit (43.2%). This likely reflects an almost uniform perception of payment risk arising from domestic and foreign B2B trade. In the Czech Republic, the total value of B2B sales on credit decreased to 43.0% in 2017 from 44.3% in 2016. This follows another marginal decrease (from 45.0% in 2015) and seems to underline a downward trend. The percentage of overdue B2B invoices in the Czech Republic continued its downward trend since 2015. 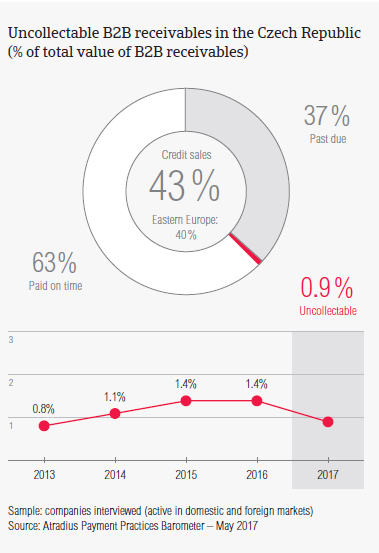 At 37%, the payment default rate recorded in the country is under the average for Eastern Europe overall (41.5%). More respondents in the Czech Republic reported late payments of B2B invoices than respondents in the rest of the Eastern European countries surveyed. 95.1% of Czech respondents reported this in respect to their domestic B2B customers and 84.8% in respect to their foreign B2B customers (Eastern Europe: domestic 88.5%; foreign: 78.9%). Similarly with what was observed at regional level, overdue B2B invoices occurred more often with the domestic customers of our Czech respondents (38.9%) than with their foreign customers (34.9%). Both these averages are lower than those registered in Eastern Europe overall (domestic: 45.2%; foreign: 37.7%). The Days Sales Outstanding (DSO) figure in the Czech Republic decreased to 46 days from 55 days last year. This is 15 days less than the regional average . Looking ahead, 75.1% of Czech respondents stated that they do not expect changes in their annual DSO figure in the coming 12 months. Of those expecting a change, 13.5% expect a slight increase while 9.7% foresee a slight decrease. Based on changes in the average payment terms and average payment delays in the country, Czech respondents seem to take slightly longer in 2017 to convert B2B receivables into cash. In 2017, domestic B2B customers of respondents in the Czech Republic were given, on average, 26 days from the invoice date to settle their invoices. This is two days longer than the average domestic payment term in 2016 and the shortest payment term given to domestic B2B customers of the Eastern European countries surveyed. 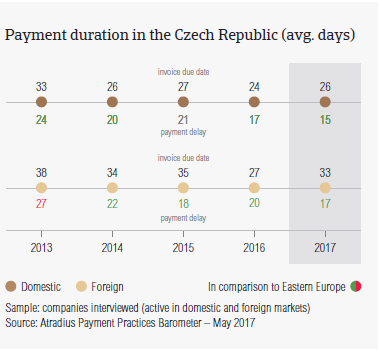 Czech suppliers granted even more relaxed payment terms to foreign B2B customers (on average, 33 days, up from 27 days in 2016). Respondents in the Czech Republic reported a decrease in the average payment delays of their domestic and foreign B2B customers. Domestic B2B customers delayed their payments, on average, by 15 days (down from 17 days in 2016). Foreign B2B customers delayed payments, on average 17 days (2016: 20 days). After Hungary, the Czech Republic had the shortest invoice to cash turnaround in 2017. Suppliers in the Czech Republic needed to wait 45 days (one day longer than in 2016) to convert B2B receivables into cash. The main reasons for payment delays by domestic and foreign B2B customers of respondents in the Czech Republic differ from those stated at regional level. 47.7% of Czech respondents cited the buyers’ use of outstanding invoices as a form of financing as the primary reason for payment delays by their domestic B2B customers. 34.0% of respondents cited the above-mentioned reason in respect to their foreign B2B customers. These were the highest percentages of respondents stating this delay factor in Eastern Europe, both significantly higher than the percentages registered at regional level (domestic: 32.4%; foreign: 27.7%). Another main reason for payment delays, cited by 41.8% of respondents in regards to domestic B2B customers, was liquidity constraints (Eastern Europe: 58.4%). 34.0% of Czech respondents stated that the complexity of the payment procedure was also a main payment delay factor by foreign B2B customers. 58.0% of respondents in the Czech Republic said that overdue payments did not impact their business significantly. 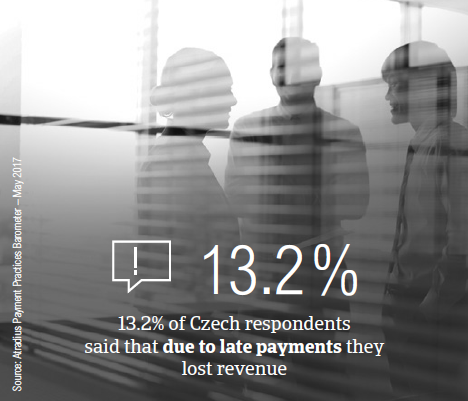 13.2% of Czech respondents, however, said that due to late payments, they lost revenue and 19.8% said that they needed to postpone their own payments to suppliers. More respondents in the Czech Republic (16.9%) than in Eastern Europe (13.1%) stated they intend to do more to protect their businesses from the impact of Brexit, the slowdown in Asia and US protectionism. This was the second highest percentage in the region after that of Turkey (26.9%). 52.2% of respondents in the Czech Republic said that in the face of the above-mentioned developments, they are most likely to maintain their current mix of credit management tools. Although only slightly below the 53.3% regional average, this was one of the lowest percentages stating this preference. When asked about which credit management actions they would take to protect themselves against the impact of Brexit, US protectionism and slowdown in Asia, Czech respondents stated that they are most likely to increase checks on their buyers’ creditworthiness (24.8%) and monitoring of their buyers’ credit risk (19.5%). The potential negative impact of Brexit seems to be the most likely to prompt Czech respondents to increase protection and use more credit management tools. 26.2% of respondents said that they are likely to increase creditworthiness checks on their buyers, while 18.9% said that they will increase monitoring of their buyers’ credit risk. A similar approach is planned in respect to US protectionism (checks on buyers’ creditworthiness: 25.9%; monitoring buyers’ credit risk: 17.7%) and the slowdown in Asia (checks on buyers’ creditworthiness: 22.3%; monitoring buyers’ credit risk: 22.0%). The total value of B2B receivables written off as uncollectable in the Czech Republic decreased from 1.4% in 2016 to 0.9% this year. This percentage is slightly lower than the regional average of 1.0%. 0.7% of the total value of domestic B2B receivables and 0.2% of the total value of foreign B2B receivables in the Czech Republic was written off as uncollectable. Previous surveys also showed that uncollectable receivables in the country consisted almost entirely of domestic write-offs. In 2017, the largest proportion of uncollectable receivables came from the construction, consumer durables, and business services sectors. B2B receivables were uncollectable mainly because of the customer’s bankruptcy (52.8%), the failure of collection attempts (26.9%) and because the cost of pursuing debtors was too high (21.4%). 16.0% of respondents the Czech respondents surveyed expect the payment behaviour of their B2B customers to improve over the coming 12 months. A slightly lower percentage, 13.0% said that they expect to see an overall deterioration. Compared to the average payment terms given in the country (30 days), B2B customers of Czech respondents in the construction and machines industries had an extra four days to settle their invoices. At the same time, B2B customers in the paper industry had the shortest time to fulfil their payment obligations (14 days). 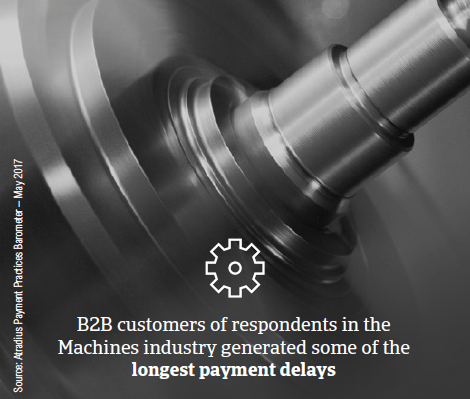 Despite enjoying slightly longer payment terms, B2B customers in the construction and machines industries generated some of the longest delays (they paid, on average, after 41 days and 45 days past due date respectively). Respondents from both the construction and the machines sector stated that the main reason for payment delays was buyers using outstanding invoices as a form of financing (construction: 58.0%; machines: 47.0%). Other key payment delay factors cited by suppliers in the construction industry were insufficient availability of funds (stated by 35.0% of respondents) and the formal insolvency of the buyer (cited by 32.0%). Around 20% of Czech respondents in the machines industry said that delays also occurred because of insufficient availability of funds, disputes over the quality of goods given or services provided and the formal insolvency of the buyer.